Every intelligent being has a mind. Sure, we have a body but it is our mind that makes us so special. We could in fact remove our limbs but as long as we had a mind we would still exist. Our mind is the real us and through this mind we exist. In fact the most fundamental teaching of life is that all of existence occurs within mind, not just our individualised lives but all of existence, including our universe. If there is one thing we all have in common it is that we are all born ignorant; devoid of any intimate knowledge. From our very first waking moment we look out on the world with wonder. We ask ourselves: What am I? Why am I here? What is the point to life? Where did everything come from? Science has propelled mankind into unprecedented levels of sophistication, and yet despite this, the things we yearn for most are the answers to a few basic questions. Never mind how much wealth, fame or academic achievement we attain, the answer to these questions will plague us for the rest of our lives. The fact that you have took the time from your busy life to read this document is tantamount to this fact. However, have you ever contemplated on what it is we are all searching for? It is quite simple really! We are all trying to unearth the mystery of why we exist. It is very easy to become caught up in our individuality. It is very easy to see others as separate and apart from ourselves, but the more knowledge we gain the more we begin to realise that we are not so different. In fact we begin to realise that we share a very strong common bond, after all. We all have the same needs. Could it be that we are the same being only multiplied in number? Initially, this may seem a strange way of thinking of ourselves but if we entertain it for just a moment we will see that is not as bizarre as first thought. We are all members of the human race, we all share the same attributes and we all have the same needs. Therefore what makes us believe we are separate beings as opposed to the same thing? On the surface we can all appear to be so different. I am not referring to our visual appearance I am referring to the way we behave and the way we treat others. It is our behaviour that alienates us from others not so much how we look. There is nothing more uplifting in meeting a like thinking mind. The harmony and peace that is generated by our feelings of oneness with another is an experience we encounter rarely, but when it happens its effects can be immense. In such a circumstance the barriers of individuality are reduced and our sense of self is merged into one another as two become one. We can all relate to this on some level, however, imagine what would happen if we all had the same understanding and thus behaved and responded to situations in a similar manner. Would we not all be in a state of oneness? Would we not all be like thinking minds? Would we not all be the same being only multiplied in number? More importantly, could such a thing ever happen? The way we behave and respond to situations is based on what we believe to be true. At this point in our evolution we are not at the stage when we believe the same things, and because of this, we do not always behave the same way, thus we appear outwardly different. Never before have we had such freedom of thought but subsequently, never before have we been so confused as to what to believe. This lack of common identity increases our sense of separation and this encourages us to think of ourselves as unique and different, when in fact we are not. If we see ourselves as a mind instead of physical identities, minds that are engaged in seeking the same answers to the same questions, we will begin to see that we share the same common mission. The only thing different between one mind and another is its contents, the beliefs and ideas it contains. It is important to recognise that although a mind can contain distinct beliefs, a mind is in many respects independent of these beliefs. For this reason it is possible for two minds to contain very different beliefs but it is also possible for two minds to contain identical beliefs. A mind is unlimited in content. So here we arrive at the one mind principle. The I of us is not our body but our mind. We are all searching for the same things, we are all trying to develop an innate understanding of what exists and therefore we are all trying to achieve the same state of mind. Think of it this way, when we finally discover the answers to all our questions, and it is beginning to happen, we will in fact become identical to one another in terms of mind content. We will behave the same way and react to situations in the same manner because how we react is dependent upon what we know and believe to be true. When this happens the many will become one; the same state of being appearing in multiple form but in a state of oneness not separation. We are all in a process of becoming the same being, something we call the Universal Mind. We Are Evolving into the Universal Mind. Unearth the ancient mysteriesof life. Read the book that is setting the spiritual community alight with intrigue, controversy and vigorous debate. 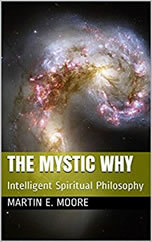 The Universal Mind & I - Intelligent Spiritual Philosophy for a new age. 5 star reviews on Amazon.